The Earl J. Arnold Advertising Card Collection was written up in the regional press long before its publication on the internet. The most comprehensive discussion was found in the publication reproduced below, George L. Moore, editor. 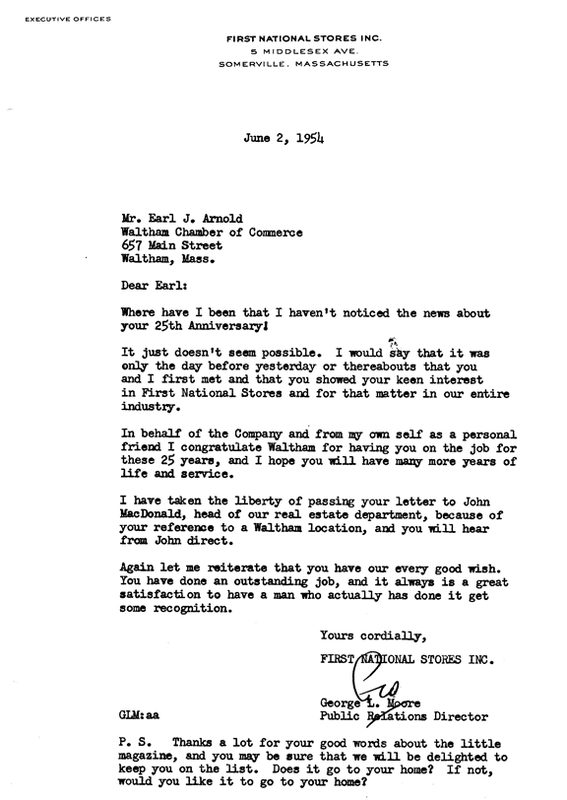 The friendship between Earl J. Arnold and George L. Moore was long-standing, as evidenced by this letter of commendation penned years before the above article appeared in Food Marketing in New England. This image is from the PDF of the 1961 ceremony found on page xiii. Permission to reproduce this article in full is pending (6 February 2017) from Ahold USA, believed to be the current copyright holder for Food Marketing in New England.